Streamlining processes can improve clinical trial management, in terms of speed, quality and better collaboration. Rik Van Mol reports on the findings from a recent survey of 300 industry professionals. The survey analyses the industry’s progress towards improving clinical operations. And the findings, drawn from feedback from 300 clinical operations professionals worldwide, reveal almost universal agreement that organisations need to unify their clinical applications in order to speed study execution, improve study quality, ease collaboration, and achieve greater visibility. 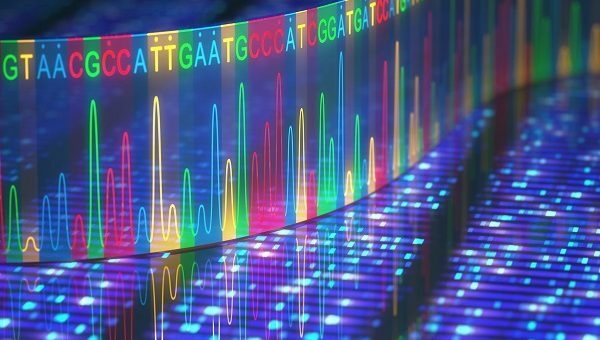 Here are the key findings from the survey and what they mean for the life sciences industry. 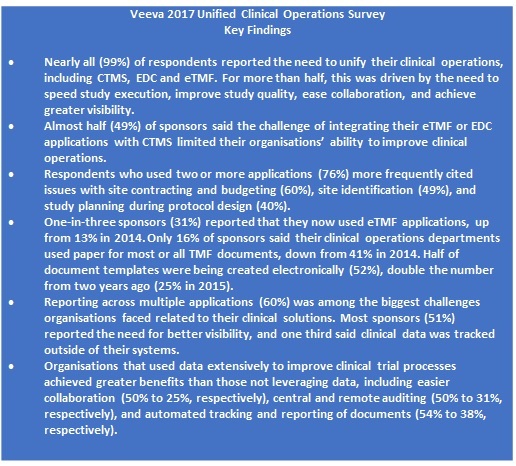 Nearly all those surveyed (99%) reported the need to unify their clinical applications, including clinical trial management systems (CTMS), electronic data capture (EDC), and electronic trial master files (eTMF). The top three most important drivers for unifying clinical applications were faster study execution (65%), improved study quality (63%), and cost savings (59%). The average number of applications used to manage clinical studies was four, with more than one third of respondents (38%) saying they used at least five applications. Not surprisingly, EDC, introduced nearly 20 years ago, was still the most commonly used application (81%), followed by CTMS (59%), and eTMF (57%). Respondents cited integrating multiple applications (69%) and reporting across applications (61%) as the top two issues facing them in utilising clinical applications. The greater the number of separate applications used, the greater the number of challenges that were reported in study start-up. Respondents using two or more applications (76%) more often cite issues with site contracting and budgeting (60%), site identification (49%), and study planning during protocol design (40%). While the number of applications was an issue, the study also showed that CTMS applications were not keeping up with the demands of today’s clinical trials, as nearly all sponsors (98%) reported challenges with their current CTMS applications. Tracking and reporting (38%), and integrating with either an eTMF application (37%) or an EDC application (37%), were the most frequently cited shortcomings. Sponsors also reported significant deficiencies with their CTMS applications, including inability to support key functions, such as resource management (77%), study and site feasibility (76%), financial management (75%), and issue/task management (73%). Monitoring was the only process most sponsors (54%) said their CTMS applications supported fully. Yet, adoption of modern, active eTMF applications is on the rise. More specifically, however, the research showed a major move away from ‘passive’ systems to ‘active’ eTMF solutions. One-in-three sponsors (31%) reported using a purpose-built eTMF application – more than double the number reported in 2014. Sponsors found active eTMF applications had significant, positive impact on inspection-readiness and improved activities key to unifying clinical operations. These include automated tracking and reporting of documents (68%), central and remote auditing (62%), and visibility into key study performance metrics (50%). To streamline collaboration and implement end-to-end processes, the survey found that sponsors were moving away from manual systems and continuing to decrease their use of paper. Across almost all functional areas measured, the number of TMF documents managed on paper was down by at least half among sponsor companies since 2014. This is a very positive trend, given that a unified clinical environment requires collaborative processes and technology. Clinical operations departments led the way, with just 16% of sponsors reporting that ‘most-to-all’ of the TMF documents they managed were on paper, a 25% drop since 2014. As more than half of the documents in a TMF are managed by clinical operations, this underscores the potential impact of this reduction. However, the survey found that there was still room for improvement in collaboration with external partners. More than two-thirds of sponsors (68%) used email to exchange TMF documents with contract research organisations (CROs). In contrast, only 19% used their eTMF applications to exchange TMF documents with external partners. The problem, of course, is that emailing documents puts information outside of controlled processes, making it harder to track and collaborate on efficiently. Metrics can help identify trends to drive process improvements across individual studies or portfolios of studies. Yet, it was found that one in four (23%) was not using, or rarely used, data to improve study processes, while roughly half (46%) only used them in some cases. However, the amounts of data collected, and the extent to which they are leveraged, directly impact improvements to clinical operations efficiency. Organisations using the most data report the greatest numbers of improvements in audit readiness, collaboration, and monitoring activities. There is industry-wide recognition that a move to a unified clinical model is necessary to address the growing need to improve the quality and speed of study execution. Clinical leaders are looking to achieve higher levels of performance across their study portfolios by implementing end-to-end processes and systems, streamlining collaboration, and leveraging insight from across the trial lifecycle. Most challenges in managing clinical trials stem from the siloed nature of processes and applications. Some of the most common applications used, such as EDC and CTMS, are based on first-generation technology. They lack the core functionality, modern architectures, and usability required to enable true end-to-end processes and visibility. Organisations that adopt modern, purpose-built applications, such as ‘active’ eTMFs, report fewer challenges and see greater benefits to their studies. And, when unified, these applications enable life sciences organisations to establish repeatable, collaborative processes and increase oversight and accuracy by consistently leveraging insight across their clinical portfolios. 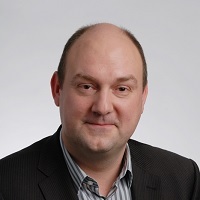 Rik Van Mol is vice president of R&D strategy at Veeva Systems, responsible for the Veeva Vault R&D suite of applications in Europe. He has nearly 20 years of experience in business/IT consulting and regulated content management in the life sciences sector. Veeva Systems specialises in cloud-based software for the global life sciences industry.